I have a friend who needed a special gift for another friend. She wanted a big quilt with a farm theme, but not a cutesy farm thing. So I got inspired by a farm scene that was a metal cut, and made my own scene in fabric. First I drew it in pencil. Then scanned it into the computer and tweaked it. Then took it to my church and used their digital projector to enlarge it and draw it onto freezer paper I taped to the wall. More refining of the shapes. begin to use my mini iron and a lot of starch to turn the edges of the applique. The design wall became a holder of shapes while I worked. There's a tree hanging upside down! I found that a doll sized tea cup was perfect for holding the starch and the handle held the brush nicely in between uses! Below is a chicken applique shape. I took a video of me turning the edges of the tail under. There was no way I was going to video turning the edges of the head and beak, but it came out quite nicely. Then I began positioning the shapes onto the background fabric on the design wall. Below is an in-progress shot. This is when my camera died for a while, so I missed getting more pictures of the process. Then I marked where the main shapes were and took it all apart so I could take it off the wall and remove the freezer paper and begin putting the top all together. I am glue basting with a water soluble glue and then machine appliqueing everything down. The top is nearly done, then I will begin the quilting, which is going to be challenging, but fun. That's all the pics I have of the quilt from a few weeks ago. I'll save the rest for another post with current progress. But below is a shot of what's going on here....snow! Not much, but we're hoping (OK, the kids are hoping) for enough to go sledding in. That's my car just outside the window of my quiling studio. Where ever you are, I hope you are warm enough, safe if travelling, and happy. I am so happy to find out that my camera only needed a new battery! It did take stopping at 4 different shops to finally find the right one, but I can take pictures again. And video. And I got to bring home a serger from the shop this weekend. It's just a loaner so I can learn about using sergers. It's a used Brother serger that is for sale in the shop. If you are local, Sew Simple currently has several quality used sergers for sale, not to mention brand new Janome sergers. Sergers can be tricky machines, especially if you have never used one and are trying to learn from a manual. That's why I got myself a Craftsy class on Beginning Serging with Amy Alan. Now that I have a serger to use while I watch the video, I understood so much more! I printed off all the class handouts and began making my stitch samples. The first stitch was pretty easy. Then it was time to take a needle out to do a 3 thread stitch and I realized I had absolutely no tools or accessories to go with this machine. Miracles of miracles, I found the right sized allen wrench to take out the needle! Now I have a whole new set of projects to add to my never ending list! Cloth napkins and some dresses or skirts for my daughter are near the top of that list. But I have also been making great progress on a special commissioned quilt and it's really taking shape. I'll post about that next time. I almost forgot, I taught another beginning free motion quilting class at the shop on Saturday and we had a good time. The gals picked it up quite easily and nobody had any major tension or machine issues. Of course, they all were using Janomes! (I am a bit biased, I suppose.) One gal did have an older machine without the needle down function and it was a bit difficult for her, but she was a trooper and did quite well. I'll be doing another beginner class February 15th and then I think I'm going to work on an intermediate class, where we can play with some new designs. Ok, back to my sewing, quilting and serging! I hope you had a lovely weekend and got some stitching or other creative activity done. Leah Day has made a free motion convert out of her husband! They've even done some videos with him stitching to help show beginners what it's like to be learning this great skill. This post talks about learning that machines don't like going in a particular direction (mine certainly hates to go directly backward) and that if your hands stop, so should your machine. Very good points! The marvelous Leslie at MarveLes Art Studios was showing some wonderful free motion couching. For all you Bernina users who have been stymied to figure out how to do rulerwork, the Bernina free motion couching foot is something I long after! Janome has one, but it isn't as well designed. Leslie also posted about the book "Quilting Wide-Open Spaces " by Julie Madsen, aka Green Fairy Quilts. I think I need to get a copy. If you haven't seen the quilting over at Green Fairy Quilts, go check it out because the quilting is drool worthy! All on a longarm, but the designs work equally well on out domestic machines. And if you're looking for some great quilting ideas for your quilts that are beautiful and still cuddly, not over-the-top show quilting, go check out Tanderwen Quilts. She's been doing quilting for customers on a domestic machine for a while and has recently moved up to an AQPS George (possibly my dream machine), which is a sit-down longarm. She's like me, doing what she can with working from home while raising her little kids. Now, for some serious eye-candy, I'll direct you to Phillippa Naylor's website. Her "Quilting in the Limelight " might be one of my favorite books. I love the peek it gives into the life of a professional quilter and features her stunning work. 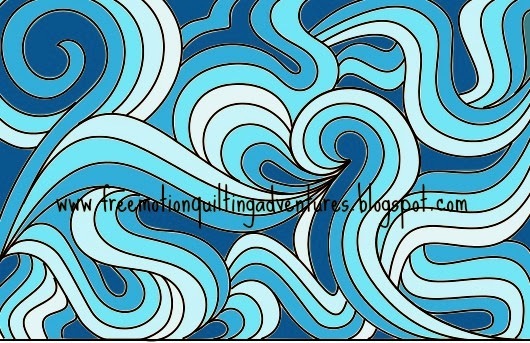 And blog reader Michelle of Mmm... Quilts, is another talented longarm quilter. She's recently posted a project that shows some great ruler work. I particularly like the border treatment, which can be done with a bit of marking and a curved ruler. There's so much more to see and learn about on the web! But moderation in all things I guess. I hope to get a new battery for my camera today so I can resume putting my own pics on the blog and shoot some more videos! I'm still without a camera. Trying to decide if I want to see if it's the battery and/or charger or if it's just time to buy a new camera. The charger seems to think the battery is fully charged. I admit it, this took a long time! Now I've got to go quilt! My camera has died, or hopefully just the battery pack has died so there are no pictures today. I am working on a commissioned quilt that I had hoped to finish before Christmas. Thankfully, the customer is a friend and is very understanding of my slowness! This commission came right after my declaration that I'm not doing big quilts or bed quilts, and this quilt is both. But it's an arty one too, so it's pretty interesting. I am teaching another beginner's free motion quilting class next Saturday at Sew Simple in Lynchburg, VA. I am really looking forward to it. Soon I will offer some intermediate classes, possibly a series of them and a class using rulers too. If you are local, let me know in the comments if you want to take one. Make sure you aren't a no-reply blogger or leave another way for me to contact you. The shop is very small and is mainly a sewing machine sales and service place so we have to limit the size of classes. But it is great to have a place to teach. He sells Janome, and I bought my machines there. I am seriously tempted by the 8200 there! I've got to tell you, I really am blessed and encouraged by those who read my blog, visit the blog's Facebook page, watch and subscribe to the video channel and most of all leave me comments here! I'm just puttering along here, having my little adventure and it's so cool that folks want to share it with me! Setting up all this techy web stuff has certainly been a challenge, but I hope it will help me recover from a serious case of mommy-brain and sleep deprivation. At least my theory is using my brain has got to keep me from losing it, right? With my youngest child now four, and the activity generated through this blog and quilting stuff locally, I am really starting to feel like Amy again and not just Mommy. I love my babies, but I needed this outlet! I don't regret for an instant having the babies take over my world when they first came along, but now they are a little more independent and so am I! I am not sure where this adventure is taking me, or if I am just merely rambling around with no major direction, but I am very happy to be on it. 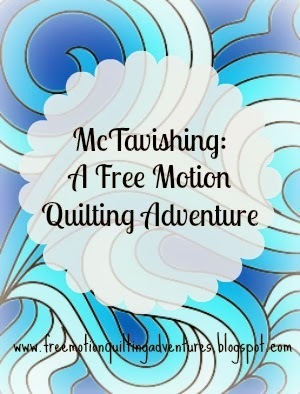 A while back I mentioned the freemotion quilting design known as McTavishing and suggested we do a "McTavish-a-long". Several folks commented on the post, thinking it was a great idea. So it looks like I'll set up a 'Linky' thing soon so we can share what we're doing as we go. I've got to get a few more samples worked up and such and we'll give it a go on a Monday in a few weeks. In the meantime, watch my video above and you might want to look at Mastering the Art of McTavishing , by the master herself! While Karen is a longarm quilter, the DVD has a segment shot with someone quilting on a sewing machine also. Well, crud! It appears her book is currently unavailable on Amazon. ......Goes rummaging through the massive piles of books and emerges an hour later...... I also have her book, The Secrets of Elemental Quilting , which shows a lot of McTavishing in the quilts featured in it. After I stopped shooting the video, I continued the McTavishing for a while. It's really just a series of curvy echoing lines, but it sure takes pratice to get it looking just right. I think I like the part without the curly spiral parts best. There is definitely some backtracking involved too, which really shows in this contrasting thread. Practice, practice. I can't wait to get started! I'm linking this post up with all the other fabulous quilting folks over at Connie's Linky Tuesday at Free Motion by the River. Go check it out! I'll be the first to admit it, I am not much of a piecer. I know many a quilter who loves to piece a quilt and have it quilted "by check" if it's a larger quilt. I know many more who make a top with great love and then do their best to quilt it themselves and do a fine job of it, but with not quite as much love for the quilting. And it's my joy to know quilters who love the quilting aspect of the quilt as much as I do, though they're usually better piecers than me! For me, I see the top as a canvas for my quilting. So my inspiration tends to come from arts and graphics sources. Not that I consider myself all artsy-fartsy and knowledgeable. I fail when it comes to all the proper art terminology. (OK, maybe a C-.) Some inspiration comes from a song or story. I find graphics, doodling, and illustration to be so inspiring. Zentangles are fabulous! So below are some of my favorite artists right now. Peony and Parakeet- She does lovely work with paints, doodling, and collage. She has given me some ideas for using my lovely $5 Goodwill scanner and freeware Inkscape graphics program too! Geninne- This isn't the first time I've mentioned her on my blog. Watercolor artist, illustrator, stitcher, sharer of her gorgeous husband-designed house(s) (There have been a series of houses). And homeschooler. Oh how I wish she could shed more light on how to homeschool two boys and still keep her home so uncluttered and minimalistic! Johanna Basford- Ink evangelist; not of tattoos, but of hand drawn illustrations in black ink, which are then usually screen printed after being tweaked on the computer. Her work is incredibly detailed and wild, amazing, and just darn beautiful! And last for this post, is Valerie Sjodin from Visual Blessings. An art journaler, she inspires me to incorporate scripture and words into my arty-quilts. When it comes to quilting inspiration, there are a ton of fabulously talented quilters out there! And I am drawn to applique lately, especially anything that looks like it was inspired by William Morris. And of course my own designs, which include plenty of room to quilt! I re-shot the feathered flower design I had done a few weeks ago. This time I have the open toe on my Janome Convertible free motion foot set instead of my ruler toe, so the visibility is better. I'm going to link this up at the link parties for Leah Day's Free Motion Project and Nina Maries Off the Wall Friday. We're recovering from our "Polar Vortex" and our house was nice and cozy. Others have not been so fortunate. Burst pipes at a friend's house and at the sewing machine shop where I've been helping out one day a week. The kids and I filled some balloons with water and let them freeze overnight, for some round ice "decorations". I tried to blow some bubbles to see if we could get them to freeze before they popped, with some fleeting success. Alas, no pictures! Note to self: When you use a Post-It note as an important warning, make sure the sticky doesn't get worn out! I happened to zig-zag a pair of pants to my needle plate today! That's much better than slamming the needle into the needle plate, breaking it, and potentially throwing the machine out of time. My daughter and I have been working on making a play mat for her Lala Loopsy dolls. Have you seen them? They're a mass manufactured doll made to look like a home made doll, with eyes that look like buttons and other "stitched" details. I did a little raw edged applique with my free motion skills. It's no Pinterest worthy masterpiece, but my daughter loves it. And we did it together, which makes us both happy! I am batting zero this week. I tried to do a video on double curved crosshatching and fouled up three times. Then I switched to just curved crosshatching. Shot a video and finished the triangle on the right. See? Not bad. But the video? Not so good. It's long, boring and rambly. Maybe I can shoot a different one soon. I'll add it to my To-Do list, the one that's got me so overwhelmed that I don't seem to be able to do anything. Ever have days like that? It's all part of my regular life with the addition of my big secret project, which hopefully will get to a point where I can either drop it or move it along in the next month or so. Any who..... here are the rulers below that I used. The straight ruler I used to help get nice, straight lines for my triangles. The ruler along the top is a double "S" curve ruler by Rhonda Byer that can be ordered through Quilter's Rule. Her double "S" rulers are the ones used in Karen McTavish's book Custom Curves . I think they would benefit from more etched guidelines; the curves aren't identical so you've got to flip the rulers around and there's quite a bit of repositioning to do. I use some painter's tape to help mark the are of the curve I am using. I used the half circle ruler for the curved crosshatching since the triangle was small. The regular curved ruler has too slight a curve for this size triangle. The rulers with the pegs are Fine Line Rulers from Accents in Design. The pegs and velcro hooks on the underside make them easier to use on a sitdown machine where the quilt and ruler need to move as a unit. The half circle rulers don't have the handy 1/4 inch markings along the curve though, which is unfortunate. I had to eyeball my spacing. Though it came out nicely. My hubby is home this weekend (did I mention he's been working on an out-of-town project for the past 6 weeks with at least that many to go?) and I'm hoping to talk out some of my plans and such with him and try to get things workable before I go bonkers. I am hoping to re shoot the video soon and make some new ones too! Enjoy your weekend and practice your free motion, even if it's just some doodles! For other FMQ inspiration, check out Leah Day's FMQ Friday Link Party.